Take a step back in time to the golden era of Jazz with the Cotton Club Quartet. This group of highly experienced professional musicians will entertain and delight your guests with their sound. Travelling all over Ireland, Although we are an upbeat group, their small discreet sound system can squeeze in to the smallest of spaces. So whatever and wherever your venue, The Cotton Club Quartet are the musicians for you! 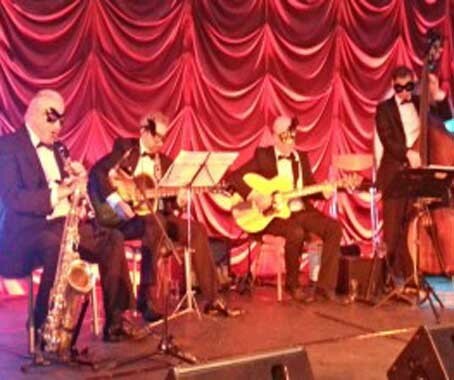 As well as their Swing Set, they also have an extensive Latin/South American Songbook, European Gypsy Jazz repertoire and a large collection of Early New Orleans Jazz tunes. "We just wanted to say a big thank you to you and the rest of the band for making our wedding day so special. Everyone thoroughly enjoyed the music you guys played at the drinks reception. It was really fantastic and got the celebrations off to a great start!!" Provide your details below and The Cotton Club Quartet will be in touch soon.